Hey friends! 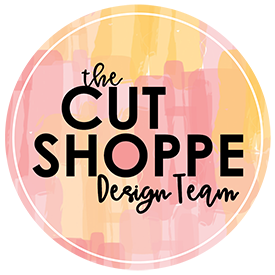 I’m back today with a recent layout I created for The Cut Shoppe using the Freebie Friyay With Love Cut File. I set a goal at the beginning of 2018 to read 24 books. It was a lofty goal, because the year before I think I only read 1 or 2 books. I enjoy reading, but struggled to find books I liked at the library. I don’t follow authors or new releases so I never knew what I was looking for or what was new. Then I discovered Book of the Month (BOTM) and I rediscovered my love of reading books! I actually beat my goal and read 27 books in 2018! 26 of the books were from Book of the Month and 1 other from another book subscription I tried, Blind Date with a Book. I wanted to celebrate/document meeting my goal so I printed a screenshot of my “bookshelf” from BOTM. I started by cutting the With Love Cut File on white cardstock using my Cricut. I then traced the inside of the heart on another piece of white cardstock. I used an older stamp set from Illustrated Faith and numerous Scrapbook.com Inks to spell out the word “books” in a rainbow of colors at a diagonal. The stamped words ended up being a little too bright so I added a layer of vellum over the words to help mute the boldness of the colors. Many of Paige Evans Collections contain book related embellishments so I knew immediately wanted to use those collections. I started with the Pink Paislee Paige Evans Whimsical Collection. I grabbed Patterned Paper #3 (which is also included in the 12×12 Paper Pad) to use as my background and positioned the cut file so it was running off the left side of the page. I then used a pencil to trace the inside of the heart on the patterned paper and cut out the center of the heart. I added the stamped white cardstock in that spot, and positioned the cut file on top of all of those layers. I then moved onto embellishing. I grabbed a few of the Whimsical Floral Die Cuts and positioned them along the top right of the heart. I also grabbed a few Ephemera Die Cuts; including the frame & butterflies. I thought one of the Whimsical Tassels would add a nice pop of color and added texture so I positioned one along the framed photo. I also grabbed a sticker from the Whimsical Sticker Book that says, “She believed she could so she did”. I also grabbed a couple book chipboard stickers from the Pink Paislee Paige Evans Oh My Heart Collection. I wanted to add the number 27 somewhere on the layout, but the 7 in the Whimiscal Thickers was green. I didn’t have any of that color on the layout, so I reached for the numbers in the Pink Paislee Paige Evans Pick Me Up Thickers. The colors matched perfectly! Once I had all of the die cuts in place, I added white machine stitching around the cut file heart. I needed to add journaling to this layout because I had the number 27 on the layout, but only 26 books are shown in the photo. I thought white cardstock would be too much of a contrast to add onto the pink patterned paper background. I decided I would print my journal and then add a little color to the copy paper to help it blend into the background. I grabbed my Vicki Boutin Stencil Brush that I had used with a Red Art Crayon when I was creating my December Daily. I happened to rub the brush on a scrap piece of paper to see if I needed to clean the brush before using a different color art crayon. When I was testing the brush, I realized that the remaining color on the Stencil Brush was the perfect color! I just used the brush on the copy paper that I had printed the journaling on, and cut it into thin strips to add onto the background. I had a small typo in the journaling, but didn’t want to go through the hassle or reprinting so I used one of the Whimsical Enamel Dots to cover my mistake. I then decided to add a few more around the layout along with a few tiny Puffy Stickers from the Whimsical Collection. Now you can take a look at my process video to see step-by-step how this layout came together. I’ve set a new goal for 2019 to read 30 books, and I’m off to a slow start. I’m only 2 books in, but I’m not giving up yet! HA! Did you set any goals for 2019? If one of your goals is to break out your die cutting machine and use it more (which I totally think you should!! ), then remember to head to The Cut Shoppe Store to check out all of the cut files & digital collections! This blog post contains affiliate links. This means I will receive a commission and/or free product (at no cost to you) from items purchased from those links.